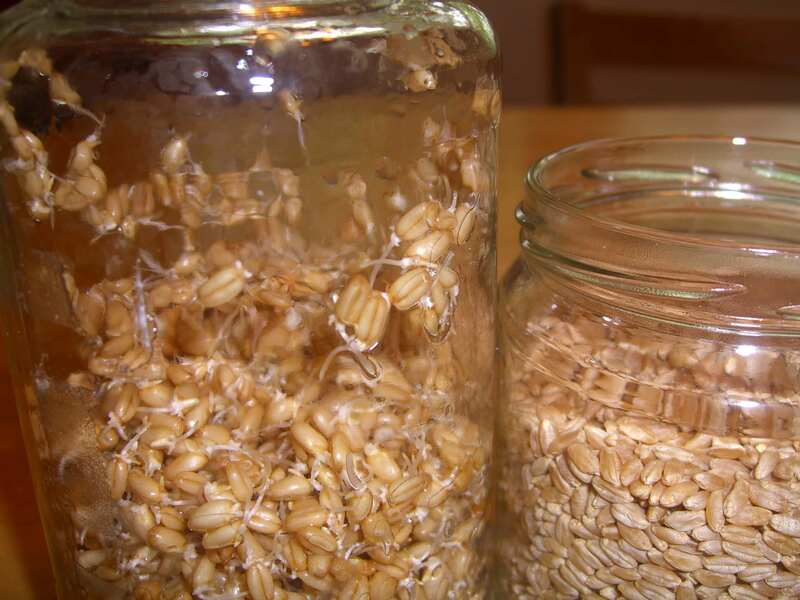 Sprouting is becoming a popular nutritional step in many homes now. I’ve read about it in gardening books and heard rumor of it in blogs. The news intrigued me. I decided to try it because really, it couldn’t be that difficult. And boy was I ever…RIGHT! It’s not challenging at all! I was thrilled because I’ve thought that very same thing about numerous other “kitchen experiments” and been sorely disappointed. But not this time. I didn’t even lose a lot of money or make a big mess during my trial. I call that a super-success! Now that’s not to say my experience was a perfect one, because there are a few mistakes that can be (& were) made along the way, so I’ll be sure to share my learning with you. 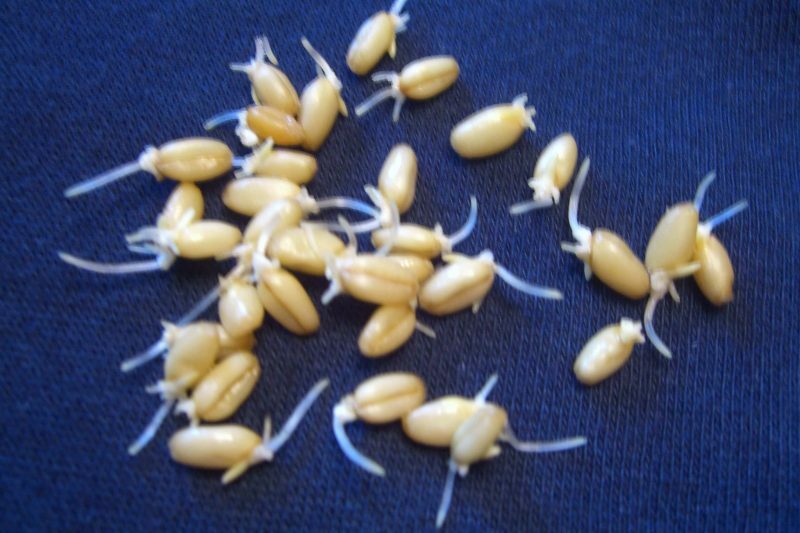 Why should we sprout grains? Vitamins, Minerals & Protein. Sprouting grains and beans makes them better for you. Advocates of sprouting claim it increases the vitamin content of Vitamin C, folic acid, niacin and riboflavin by as many as one hundred times when compared to unsprouted wheat. Lloyd Rooney, a professor of soil and crop sciences at Texas A&M University in College Station, says that sprouted grain breads may also be higher in protein because of the sprouting process. Nutrition. Enzymes introduced during the sprouting process break down or neutralize phytic acid. This “breaking-down process”, according to Margie King, a Philadelphia Nutrition Examiner, allows the consumer’s body to absorb the minerals zinc, calcium, copper, iron and magnesium found within the grains. Without this phytic acid active in the grain, your body can take advantage of these nutrients, thereby making the grain itself better for you. It has to do with amino acids and protein bonds and such, but before we get too complicated, let’s move on. Health. If you are eating a raw diet, sprouting adds extra enzymes to your menu. When you choose not to heat your sprouts, enzymes are stable and will remain in your sprout for addition health benefits. People who have a sensitivity to wheat (NOT to be confused with gluten intolerance or celiac disease) may be helped by the presence of these enzymes. They may find that their bodies are more able to break down wheat in this form with thanks to the natural enzymes activated through the sprouting process. Sugar & Preservatives (or the lack thereof). For diabetics or those just wanting to keep their sugar levels on an even keel, sprouted grain breads have a lower glycemic index than whole wheat breads. Additionally, most of these “living breads” (they are so named because the grains or seeds have been awakened from hibernation by the soaking process) contain no preservatives. For this reason, if you look for them in stores, you should likely check the refrigerated section. Taste and texture. Sprouted grains have a unique earthy or nutty taste and texture when added to your favorite foods or baking recipes. 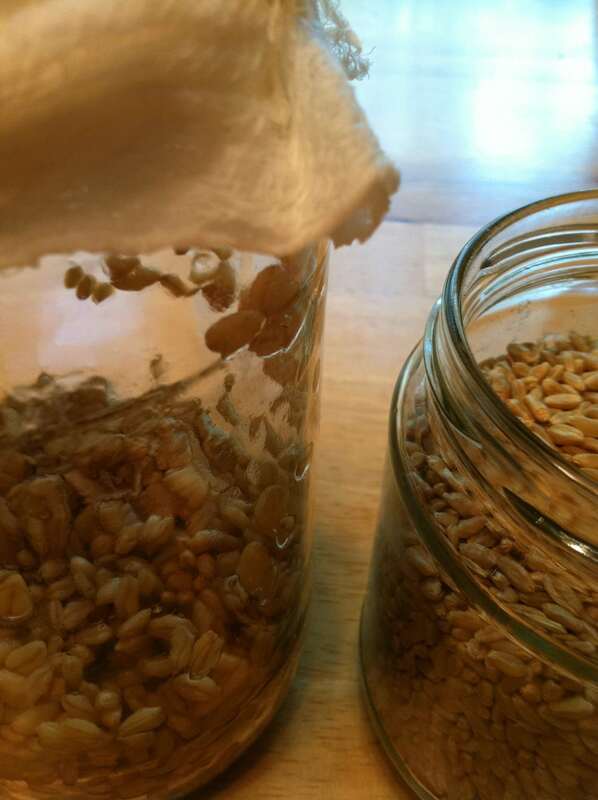 In a mason jar, pour 1/2 cup wheat berries (I used hard red) and 2 cups lukewarm water. Cover top of jar with mesh (I used cheese cloth and a rubber band to secure it). 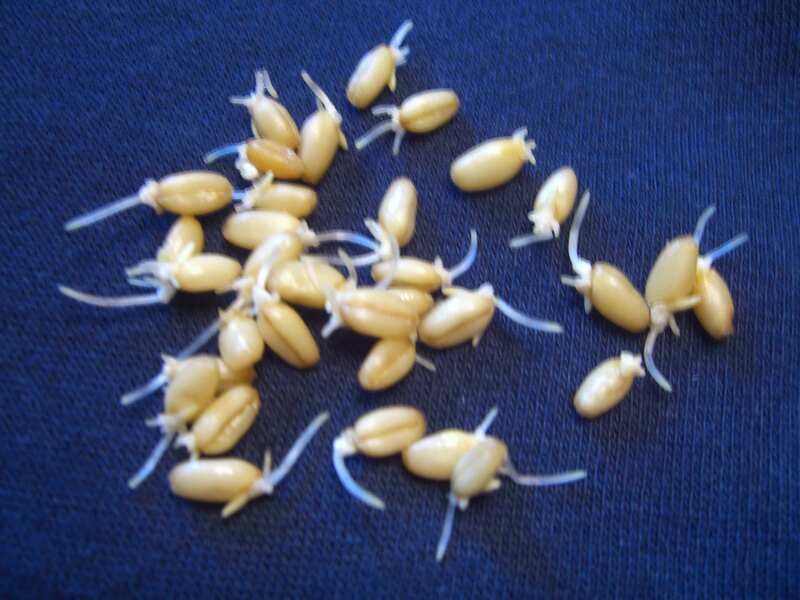 When white sprouts are approximately 1/8″ long, they are officially sprouted! Plant them in well drained (preferably organic) soil to grow wheat grass for juicing or just for fun! Keep them covered, but make sure your sprouts get plenty or air circulation so they don’t rot or mold. Rinse your sprouts more often in dry conditions. Place your jar in a dark location so they don’t begin photosynthesis. Don’t mistake the 1 to 3 white “legs” that emerge just after soaking for a sprout. Keep them wet but not in standing water (with the exception of the initial soak, of course). Keep them at a comfortable room temperature (around 70ºF). Don’t be alarmed when your soak water gets a little cloudy – this is normal and it will be drained off. Get your children involved – they’ll LOVE the process! I would love to try this. My question is, once the wheat has sprouted, how do you store it, if you don’t dehydrate it for flour? in the refrig? @Carol Radtke, You can store it for several days in the fridge, if you’re not ready to use it right away. You may just want to give it a quick rinse before you do go to use it, but it will definitely keep for at least 2-3 days this way, sometimes longer. Sprouting is something I’ve wanted to start, but haven’t done yet. Thanks for the helpful and encouraging tutorial! About how long would it take to dehydrate the sprouted grains? I’m trying to figure out if I’d be able to do enough of this to have a decent amount of grain to grind every week. @Jessica, It takes me about 12 hours or so. Am I right to assume that you would have to dehydrate in a dehydrator or could you do it another way? @Kim G., It is somewhat possible to be able to do this in an oven on a very low heat or perhaps even overnight with just the oven light on (it heats the oven more than you would think), or possibly even outside during the summer if you live somewhere dry. But generally, a dehydrator is the easiest and most reliable method. How long does it take to sprout? I’ve had my wheat going for about a week and nothing is happening. @Barb, Something must be wrong, then. It usually begins to sprout within 24-48 hours, 72 at most. Did you soak overnight first, then drain off the water? 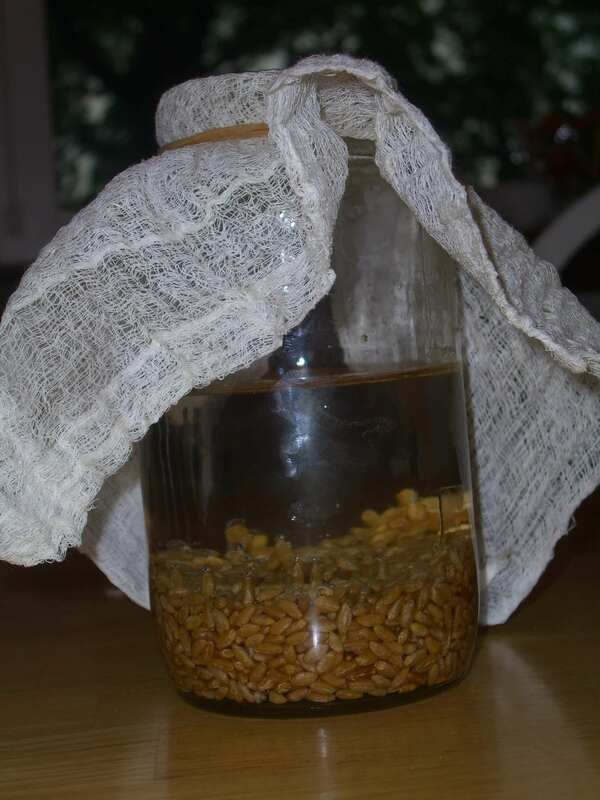 Are you watering it a few times a day to keep the wheat berries moist? It definitely should be sprouted by now. I did soak it, but maybe not long enough – 8 hours. And I kind of figured they went bad by the smell they had this morning. YUCK! I’ll give it a try again and follow the directions more literally. I don’t remember what site I got the original instructions for so I’ll just look here first. By the way, I really appreciate your blog. It’s so helpful and encouraging. This website: sproutpeople.org/ has a lot of information about sprouting different kinds of beans, seeds, nuts, etc. I am trying wheat berries for the first time today, but I have tried soy beans, mung beans, black-eye peas and all the sprouts are great. I make sprout salads, curries, and stews and they are very tasty and comforting for the whole family. Hi! Besides bread what other uses would you recommend for the sprouted wheat berry? Could I use this method with other grains, such as rye berries? Thanks! I began the soak for my spelt berries yesterday, at 9 a.m. & meant to rinse, etc. before bed, but forgot. I went ahead and rinsed them this a.m. about 7. Do I need to start over, or will it still work? Thank you! As long as they still sprout, and they don’t start to smell funny or look slimy (ie. as long as they don’t go bad) it should be fine. 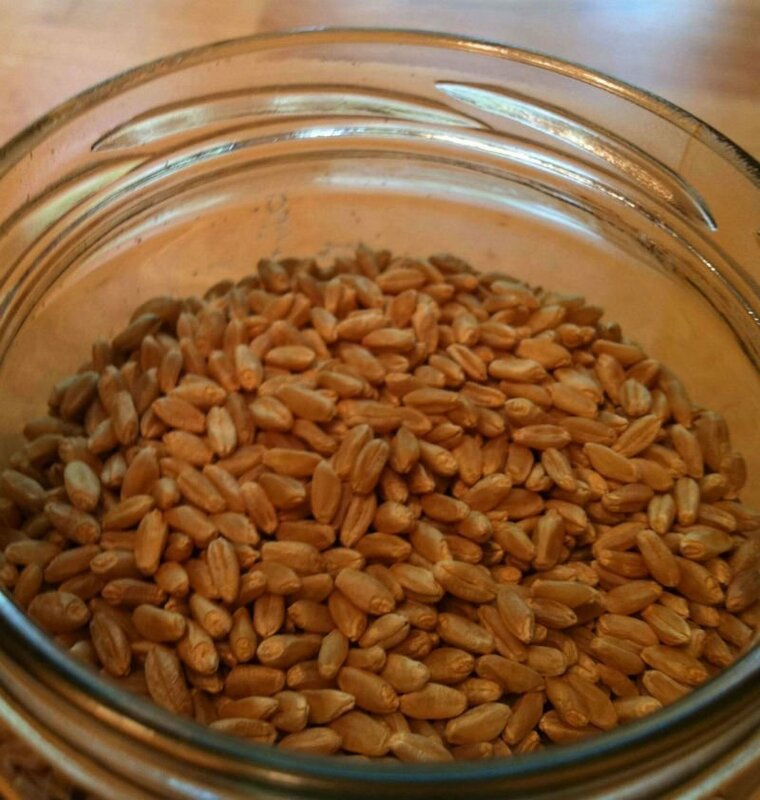 Great blog post about sprouted wheat berries! In case you haven’t heard, Essential Eating Sprouted Foods has a delicious line of organic, sprouted & kosher whole grain food products such as cereals, pastas and pretzels that digest as vegetables. Check us out at http://www.essentialeating.com! I have been sprouting wheat for a while now. I have tried this method and have been making delicious loaves , but i seem to have a problem my wheat wont sprout that long as in the picture above. I live in Egypt and the wheat here is probably not that fresh is that the reason? and will i still get the benefit of the sprouting process , …..
My mother often made sprouted wheat bread. When the seeds were white with several sprouts, she would take it all without drying and run them through a food processor until it was a hunk of the consistency of stiff oatmeal. She would Make them into large buns and bake them. Usually she added nothing. These were 100% sprouted wheat. They backed into fairly heavy, but tasty rolls. The sprouts from the wheat tends to be very sweet. Occasionally she would add a little cinnamon or some raisins, but they were so good plain. 1.NUTRITION: Eat lots of Fruits, Vegetables, whole grain and plant based protein: Nuts, beans, legumes. Only add the other in from time to time for a special occasion. 2. EXERCISE: Walk to town, around the block, to visit a friend, If the weather’s bad do something inside, but if you can, do your exercising outside. Be regular: 15-30 min each day, 4-5 days each week. Don’t take medicines unless you absolutely have tried all other alternatives. Talk to your doctor about trying other ideas. If he/she is not willing to try some other methods, change docs. 4. Be respectful to everyone: Your spouse, children, extended family, medical people, teachers, police officers, people you disagree with, waiters, store clerks – EVERYBODY! You are never better than anyone else, so respect should always be shown. 5. Be social. Join a card group, join a charitable organization that helps people. Go to church, be in Bible studies, help out in the nursery or kitchen, or teach a Sunday school class of really cute little ones. Invite friends over for tea, coffee, whatever you like. Practice Hospitality. It doesn’t have to be fancy, just has to be social with everyone feeling happy when the evening is over. 7. Travel when you can. See the sights around you, then travel the world. Study about the places you’re going to go. Learn a few words in each language. Make each trip an interesting adventure. Stay in safe places, but not in the best hotels, there’s no adventure in that! Appreciate the host country. Be helpful, kind and courteous. 9. Budget your money well. Don’t spend money you don’t have. Give away 10-12% of your money to churches and charities. Surprise a friend when you’re out to lunch. Grab the bill and pay it! Give a little now and then to someone who doesn’t deserve it. 11. Forgive, forgive, forgive. When someone hurts your feelings, cry over it for a day or two, then put it away and move on. Don’t hang on to bitterness. Know how to look someone in the eye and say, “I am sorry, I was wrong”. or, “What you did was wrong, but I will forgive you. 12. Go to church and know what your church believes. Read a Bible and talk about it with a Bible group. Follow the teachings as closely as you can. The priority is to find places where you can improve. Let others find their own places, you don’t need to point out their faults to them. Share the joy with others, but never harass someone about your beliefs. It’s God’s job to harass if there is any harassing needed. Fall asleep every night thanking God for your blessings. I don’t know if any of the above has any scientific studies to prove my mother’s 1 dozen reasons for a good life, and I’m sure they can be tweaked here and there to suit you best. But even with some heartache and challenges, my Mother is strong, independent, and can laugh out loud in a way that causes everyone to join in. Sorry to get so lengthy. But the fun of making 100% sprout bread brought memories flooding my mind. I’m going to start spouting some tomorrow. Thanks!